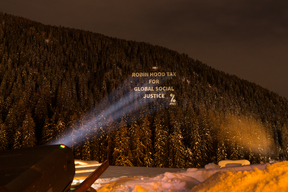 Davos, Switzerland, 25 January 2018 – Greenpeace Switzerland activists today projected messages from Amnesty International, European Trade Union Confederation, Fight Inequality Alliance, Greenpeace, International Trade Union Confederation, Public Eye, Attac Switzerland and the Swiss Coalition for Corporate Justice onto the hillsides facing the World Economic Forum. The messages are united in their demands to leaders for urgent changes to an unjust system that exacerbates inequality, damages the environment, threatens human rights and creates injustice. “While our messages are diverse, they speak to one truth. The current economic system is broken and corporations who do wrong must be stopped from profiting at the expense of people and planet,” said Jennifer Morgan, Executive Director, Greenpeace International. This year at Davos, civil society groups have been vocal in their critiques of the current economic system. Greenpeace, for example, launched the report ‘Justice for people and planet, ending the age of corporate capture, collusion and impunity’, highlighting 20 cases of how corporate power has led to environmental and human rights damage, and proposing ten common sense principles for reform. Public Eye: Governments, don’t shmooze with corporations (regulate them)! Swiss Coalition for Corporate Justice (Konzernverantwortungsinitiative KoVI): Konzerne: Menschenrechte & Umwelt respektieren! Multinationales: Stop aux Abus!